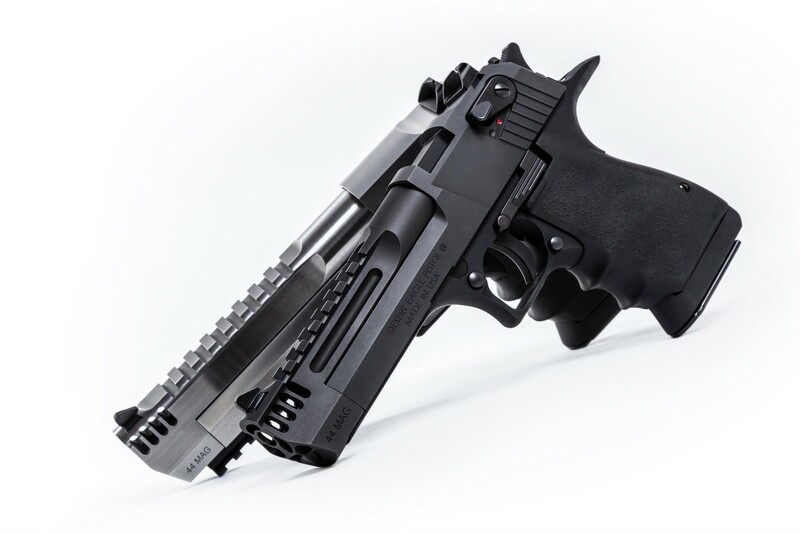 Weighing at an almost 5 pounds, the stout Desert Eagle has always been in demand for two-fisted handling. 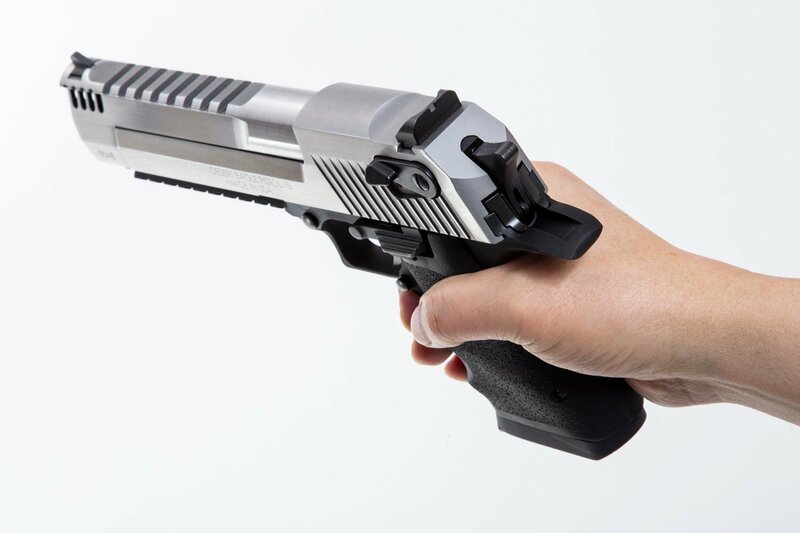 Now, Magnum Research is proud to introduce two lighter weight models which make a noticeable difference when handling the pistol – albeit two hands are still recommended for most shooters. The Desert Eagle L5 and the L6 are lighter by a pound or two respectively in comparison to other similar Desert Eagle products. 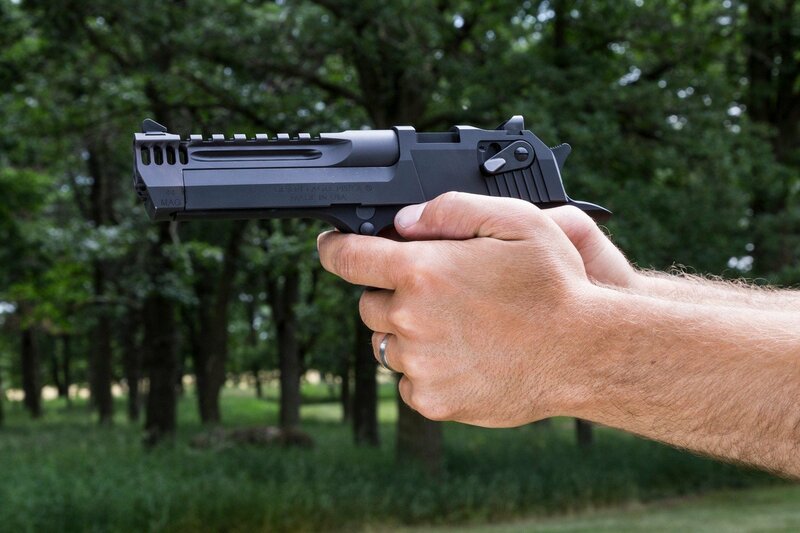 The Mark XIX L5 in .50 AE, .44 Magnum and .357 Magnum are offered with an all 5-inch barrel length and feature hard-coat anodized black aluminum frame, black carbon steel slide and barrel, and Hogue® finger groove rubber grip. 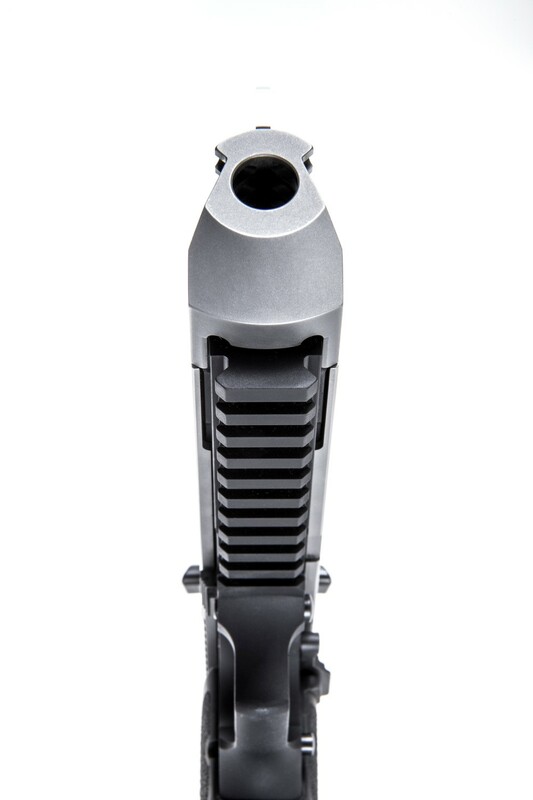 The pistol also has Magnum Research’s widely popular integral muzzle brake. Overall length is 9.75”, height is 6.25” and the slide width is 1.25”. 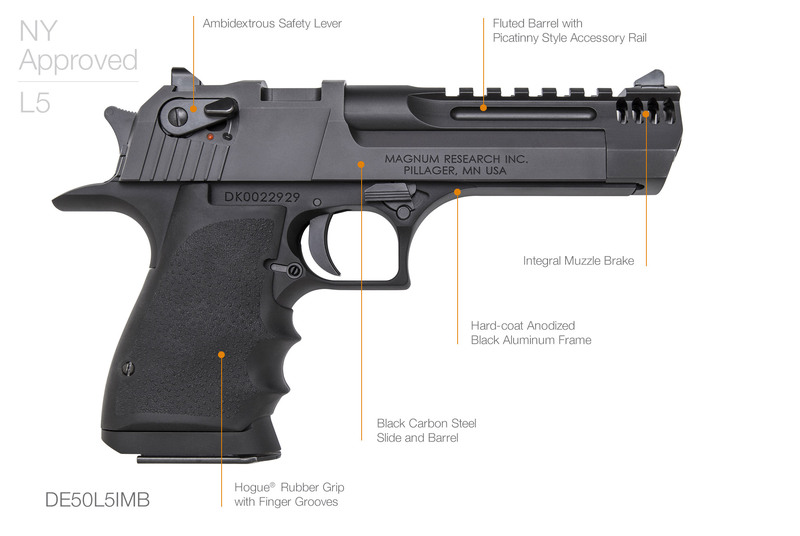 The light-weight Desert Eagle L5 models are New York State compliant. The Mark XIX L6 in .50 AE, .44 Magnum and .357 Magnum are about 11 oz. 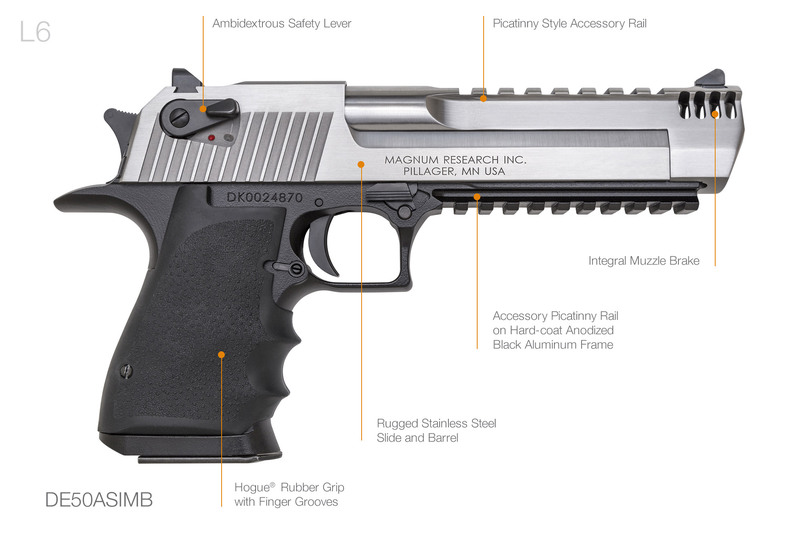 lighter than other similar Desert Eagle models. They are offered with a hard-coat anodized black aluminum frame, stainless steel slide and integral muzzle brake barrel, attractive black appointments and feature a picatinny rail on the frame. Overall length is 10.75”, height is 6.25”, and the slide width is 1.25”. The single action pistol has a 4-pound trigger pull. 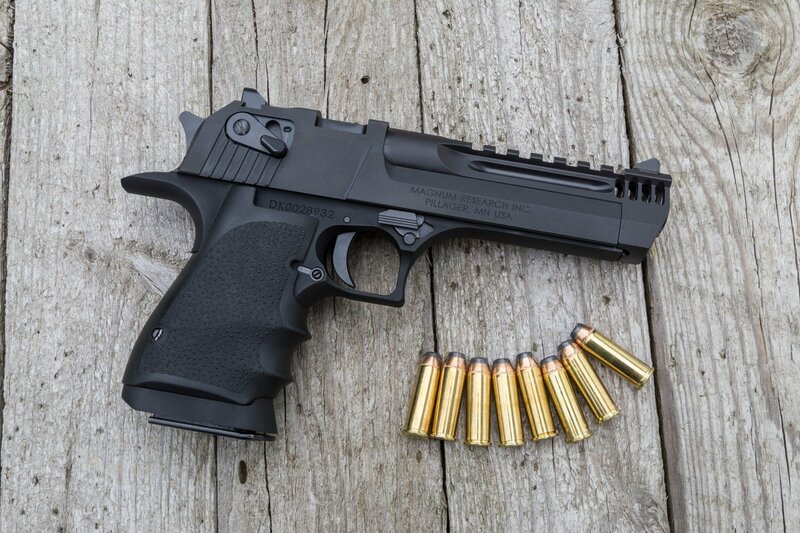 The light-weight L6 Desert Eagles take the same magazines as the current steel models.